This article goes over Retlaw Enterprises, which is a company that was started by Walter E. Disney (Walt Disney) to manage some of his business operations. A background on Retlaw Enterprises and its history is provided in this article. Also the company may have gone through a number of entity changes over the years as it the organization has been called Retlaw Enterprises, Inc (Incorporated) or Retlaw Enterprises LLC (Limited Liability Company). Retlaw Enterprises, Inc/LLC is a private company that is controlled by the Disney family, specifically the Walt Disney side of the family. The company has connections to the Walt Disney Family Foundation and the Museum that is located in San Francisco, California, as that museum is also run by Walt Disney’s family. In this article, multiple companies are mentioned that have “Walt Disney” as part of their full names. To clarify what each company represents a list of those company’s names and details are provided below. Retlaw Enterprises, Inc/LLC – The personal company of Walt Disney and his immediate family. Retlaw’s predecessors/related companies include Walt Disney Miniature Railroad Company, Walt Disney, Inc, and WED Enterprises, Inc.
Walt Disney Miniature Railroad Company – Walt Disney’s personal company created to operate his miniature railroad. Company became Walt Disney, Inc.
Walt Disney, Inc – Walt Disney’s personal company. Eventually involved in Disneyland’s development. Renamed as WED Enterprises, Inc in 1953. WED Enterprises, Inc – Walt Disney’s personal company that built Disneyland and developed various projects for Disney’s theme park operations. The company was purchased by Walt Disney Productions in the 1960s. Walt Disney Productions – The main company that managed most of Disney’s operations. Walt Disney Productions became The Walt Disney Company, which is the firm that exists today. If you have been learning more about the history of The Walt Disney Company and Walt Disney, himself, Retlaw Enterprises is one of the interesting companies that is part of the history of the overall Disney Organization. According to Walt Disney's Railroad Story, by Michael Broggie, Retlaw's origins can be traced back to Walt Disney's creation of the Carolwood Pacific Railroad. In 1950, Walt Disney created Walt Disney Miniature Railroad Company to manage the miniature railroad that he had created in his backyard. The company operated the Carolwood Pacific Railroad and would eventually move on to develop Disneyland. Walt Disney Miniature Railwood Company would become Walt Disney, Inc on December 16th, 1952 and then WED Enterprises, Inc. in 1953. It has been mentioned that Walt Disney created Walt Disney, Inc. to develop television shows; however, the company would go on to create Disneyland in Anaheim, California. Walt Disney, Inc became WED Enterprises, Inc in 1953 after concerns from the main company, Walt Disney Productions, about using the Walt Disney brand outside of the company. According to many reports, Roy O. Disney, Walt Disney’s brother objected to the use of the name “Walt Disney” for the outside company (Walt Disney, Inc). In addition, other shareholders of Walt Disney Productions were concerned about the usage of the name/brand. WED Enterprises, Inc was sold to Walt Disney Productions (The main company that is now The Walt Disney Company) on February 5th, 1965. On April 6th, 1953 Walt Disney created Retlaw Enterprises, Inc to manage his personal business operations and holdings for his family. Some sources have the company creation date, as February 5th, 1965, the day that Walt Disney sold WED Enterprises to Walt Disney Productions; however, The Walt Disney Company reports April 6th 1953 as the start date.The company maintained the rights to the "Walt Disney" name and brand, which Walt Disney Productions did not control. Retlaw is “Walter”, Walt Disney’s full first name, spelled backwards. Retlaw Enterprises Inc owned a number of the rides in Disneyland, including the railroad and monorail. Retlaw sold the rights to the rides to Walt Disney Productions in 1982, which also included the naming and brand rights for Walt Disney. Above Walt Disney Partners Statue at Walt Disney World Resort's Magic Kingdom, featuring the Retlaw Enterprises, Inc logo originally by Theme Park Tourist on Flickr. Photo modified by NavFile. Photo is released under a Creative Commons License. 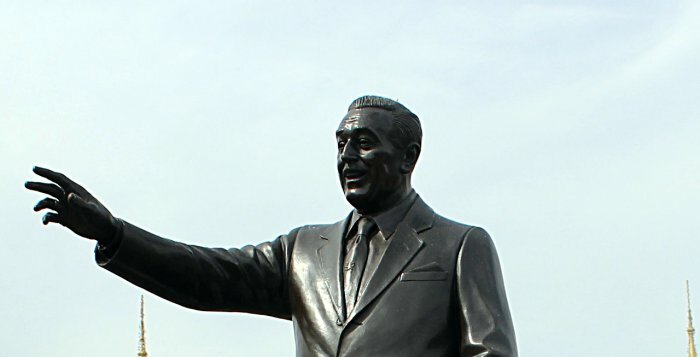 The Retlaw logo can be seen on Walt Disney's tie (middle of the photo). How Important is Retlaw Enterprises? When researching about Walt Disney and Retlaw there are some interesting observations that stand out. Retlaw Enterprises’ logo, which combines an R, E, T, and L, can be seen on some of Walt Disney’s ties and is featured on the Partner’s statue that is located at Walt Disney World’s Magic Kingdom. A photo of this is featured above. Retlaw also seems to have a website at http://www.retlawenterprises.com that showcases Retlaw Enterprises’ ideas and some merchandise with the Retlaw logo. We have not confirmed if the website is related to the Retlaw Enterprises that is connected with Walt Disney; however, it seems to be. Projects like Mineral King at Sequoia National Park are featured on the site. An interesting part of the site is the inspiration page which goes over Retlaw’s connection with Imaginautics. Based on information containted on the website, Retlaw and Imaginautics both seem to be in operation today. When looking at those factors, the importance that Retlaw played in Mr. Walt Disney’s ideas and creations seems to be very important. If you would like a good overview of Retlaw Enterprises, please see Michael Broggie’s book, Walt Disney's Railroad Story. Broggie’s book has a significant amount of information on Retlaw and how Walt Disney’s fascination with railroads led to the creation of Disneyland. You can read the book on Google Books here. Do You Need Help with Your Business or Company? David Aughinbaugh II is an individual who is focused on helping the economy grow by helping organizations succeed with outstanding customer service and innovative solutions. Learn more about David on his website here.